Why focus on electricity access for rural India? In an earlier post, Electricity access: Whats the big deal?, I discussed the relationship between electricity access and human development. So, I will not repeat the importance of electricity and its access. However, having looked at the idea of development in a wider sense now, I will discuss and debate development in a later post. In any case, electricity being a driver of development doesn't seem to be contingent on the definition of development. However, electricity is just a tool and its deployment will aways depend on how we define development. I will start with the assumption that electricity and its access are critical for development and in this post, I will introduce the problem of electricity access in India and specifically rural India. Currently about 33% of the total households in India lack access to electricity. 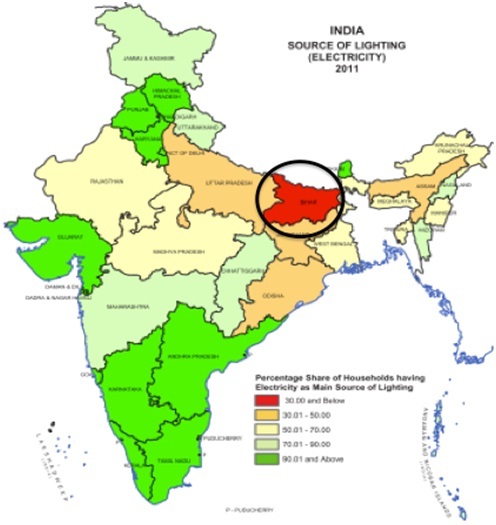 According to IEA's World Energy Outlook 2011, India has the largest number of people without electricity. This makes India the only country with an un-electrified population in triple figures. Hence, a big effort in India will be required to solve the global electricity access (1.3 billion without electricity access) problem and reach the target of 'energy for all'. 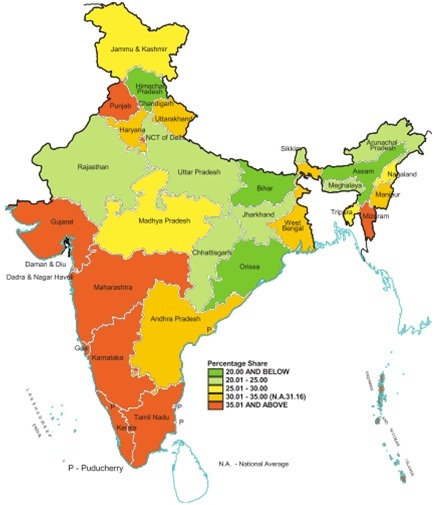 The picture of electricity access in India is one of disparity. A clear disparity in access can be seen between rural and urban populations (figure above). While in the urban areas about 93% of the population has access to electricity, only about 55% have access in the rural areas. The bias of access is also visible on regional level, with some states achieving above 90% access and some even below 30%. An interesting comparison can be drawn with the help of the maps below. It can be derived clearly that the states with lower percentage of urban populations have lower electricity access percentages. Himachal Pradesh (HP) an outlier in this case can make a good case to case study. Along with the fact that about 70% (Census of India 2011) of the Indian population is rural in nature, it must be considered that most of the Indian villages are geographically dispersed in nature. Even within the boundary of a single village, households are dispersed with large expense of fields lying between them. This makes connecting all the villages with the central electricity grid technically difficult and financially tasking. Keeping the above evidences in mind, it can be argued that electricity access problem of India is primarily rural in nature. Hence, it becomes critical to focus on the rural India and rural electrification not only to improve the electricity access scenario but also to bring equity into the electricity access and electrification approach.